Hey there! Thanks for dropping by A General Everything! Take a look around and grab the RSS feed to stay updated. See you around! Wrex fires his Crusader X at its head. The team pushes through the hallway mowing down wave after wave of Marauders, Cannibals and husks. As they reach the end of the hallway the large door opens. Wrex, a Krogan Vanguard, biotically charges the overconfident Brute as it swipes its hand through Wrex’s phased body, he rematerializes with his shotgun blade rammed into the jaw of the brute. Wrex then fires his gun into its skull. The Banshees charge in firing volleys of biotic strikes. Shepard charges the Banshees with his shotgun. Shepard modified the weapon to fire sub zero cryo rounds to slow his opponents and weaken thier armor. Shepard deals high damage while Wrex not far behind, fires an entire 4 round clip of his Crusader Shotgun into the head of one Banshee before his heavy melee slices through the torso ripping the abomination in half. Meanwhile, Shepard charges the other Banshee while cloaked with Anderson’s final grenade in hand and jams it into the Banshee’s shrieking mouth. Shepard rolls back and the grenade pops its head. Just then a group of Phantoms uncloaked around them. The Illusive Man turns toward the console. Wrex swipes his shotgun blade with the blade of a Phantom. The Phantom in front of Anderson sticks its blade to his neck. Shepard walks up behind the Illusive Man and points his gun directly to the back of his head. With that Shepard pulls the trigger. Wrex proceeds to execute them with a shotgun blast to each face. Endgame 1 *Reroute at Own Risk. Kaidan – “We don’t know that. For all we know you could end up dead. Listen I wish I had gotten to know you better sooner, I was really dense back when you first met me. The way I saw you talking to Ashley and Liara all the time, I had you pegged for some sort of ladies man. I’m glad I was wrong. Before you go I just want to say.” Kaidan looks over at Anderson. Shepard – “Then I suppose we should try it again.” He kisses Kaidan again. Shepard – “Don’t push your luck.” He kisses Kaidan anyway. Kaidan follows behind Wrex and Anderson. Shepard fastens his breathing mask and punches a few buttons on the control panel. Then the platform beneath him raises him up towards the external hull. Shepard takes 3 steps before hearing a noise that triggers a flash of a Prothean memory. He looks behind him quickly but sees nothing. Then Hacket comes in again over the radio. Shepard sprints forward at full speed still 200 meters from her target. Meanwhile the Normandy zips by overhead from Shepard’s right toward the approaching reaper on her left. The Normandy stares down Harbinger in this galactic game of chicken. With that, all the hours of intense calibration, hardwireing and rerouting are put to good use by a volley from the Normandy’s giant gun. Joker rolls the Normandy left of Harbinger as the Volley hits the Normandy narrowly misses contact with the massive ship. Even a scrape would have ripped the Normandy apart. Any other pilot couldn’t have made a maneuver like that. But Joker isn’t any other pilot. Shepard’s audio is getting through but Harbinger is blocking communication from the Normandy back to Shepard. With no response he gives up on communicating for the moment, when he nears the control panel he sees the silhouette of a figure. Drawing his weapon, he sees the figure more clearly. Little did he know, Hackett broadcast the entire conversation to collective fleets. They go at it in all out combat. Everything is on the line now, nothing held back. The Normandy broadcasting his suit audio live to the fleets, fully aware of every move Shepard makes in this critical fight. Shepard, knowing nothing of the battle overhead charges the husk of the Illusive man’s body which responds with super Human strength. Shepard’s shields deflect a biotic volley. EDI – “Commencing emergency maneuvers.” EDI takes control of the Normandy and fiercely spins the port hull to deflect the majority of the Reaper weapon’s impact. Then the Turrian Primarch comes in over the comms. Shepard ducks behind cover as Harbinger throws endless volleys of biotic detonations. But remembering how Wrex took out the Brute in the corridors, he equips his shotgun blade. Preparing to charge him, Shepard looks up. Shepard and Harbinger charge each other as the Earth stands still. The fate of the Galaxy boiled down to these few seconds. Resting in the hands of Shepard’s legacy . . .
is a shotgun and a 12 inch blade. Shepard cloaks and ducks left just under Harbinger’s arm’s reach. The monster swinging wildly, emptily from one side to another. Shepard sneaks up behind for an attack on the Illusive Man’s upgraded skull vs. Shepard’s blade. Peircing the skull from behind, Shepard’s blade won out. Shepard rips through the Reaper enhanced body with a devastating 5000 newtons, the severed torso flies off into space in pieces. With the interference gone, Shepard hears Hackett on the com channel. Harbinger growls in his most menacing tone. Harbinger growls directly at Shepard. The allied fleets barrage the Reaper in the thickest fire every ships’ captains have ever seen. But Harbinger, the oldest and the largest of the Reapers stands in the midst of a sea of flames as hot and bright as the Sun. Joker whips the Normandy around for its final run at the monster. Joker – “This is for Gunney.” he slams the fire button. With Garrus’ targeting, the shot slams through Harbinger. The Reaper growls not from malice, but from pain. As Harbinger is blown to pieces the Reapers’ chatter grows into an uproar over his death. [Epilogue] If your galactic readiness score is below 3500 click HERE now. If you betrayed the Krogan click: Blood Rage. The Crucible charges a massive amount of energy into each of the Citadel arms before firing its payload. The energy enveloped everything in the Sol system overloading the Reaper’s Mass Effect cores and igniting the Reaper’s internal power distribution architecture. If your galactic readiness score is below 3500 click HERE now. Due to the Crucible’s careful construction and precise engineering by: The Quarrians and Geth, The Rachni, Kenneth and Gabby’s innovation, Jacob Taylor and the Ex-Cerberus scientists, Miranda Lawson and Conrad Verner’s dissertation. The Crucible was able to channel its energy through the Mass Relays without destroying them. Had the engineers made a single mistake the consequences of the Crucible’s uncontrolled energy would have been devastating. Shepard can be rescued from the Crucible in one of three ways: 1 Shepard brokered a lasting peace with the Geth. 2 Shepard saved the Rachni Queen twice. 3 alternatively: Shepard cured the Genophage and Grunt survived with Arlak Company. If any ONE of these conditions are met Shepard lives. If none of these are met click HERE to see the ending where Shepard dies. Anderson viewing the Galaxy map. The Normandy docks with the Geth ship. A Geth Prime walks through the airlock carrying Shepard and speeds down the hallway. Kaidan – “One deck down through the elevator. Follow me.” Fiddling with the elevator controls. Dr. Chakwas scrubs in for surgery. All non-essential personnel are evacuated from the medical bay. Kaidan and the Prime exit the elevator. Kaidan – “Chakwas, Shepard’s badly hurt. But he’s going to be ok right? Just tell me you’ll make him all right.” Kerin looks at him sincerely. Kaidan – “That’s what I need to hear.” Kaidan walks out just as Anderson disembarks the elevator. The Admiral says a few words with the Prime, thanking it for its service before it leaves the Normandy. Then Anderson turns to Kaidan. Kaidan – “With all due respect Sir. My emotions are none of your business . . . Ack!” Kaidan’s L2 implant is starting to give him a splitting migraine. Anderson – “Do you realise I could petition a judge so you two would never see each other again.” Anderson backs Kaidan against the wall. 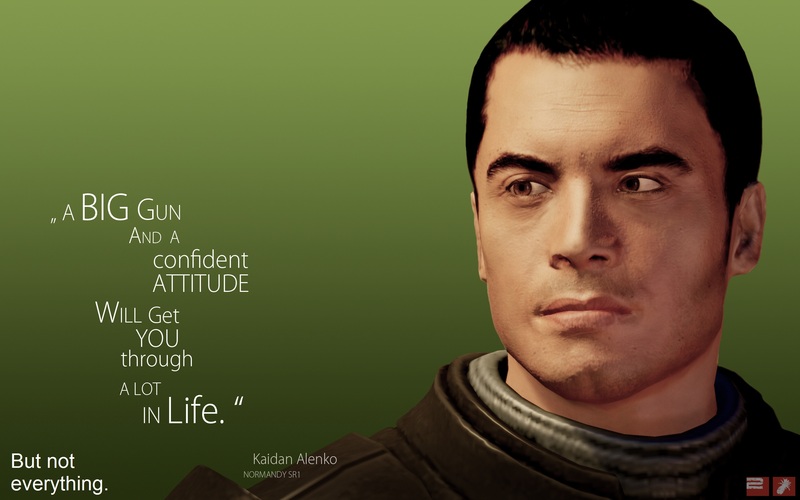 Kaidan breaks down, fighting back the tears. Through the window the assistants continue attempting to resuscitate the commander. One of the attendants pulls the window shutters closed. 2 Weeks later. At a bar on Earth by the Ocean. The cool wind flowing through the open air pavilion. Shepard and Kaidan walk up to the bar and sit down next to Wrex and Garrus. Dr. Chakwas stands up from the corner table, sharing a bottle of Serrice Ice Brandy with Admiral Hackett. At the adjacent table is Anderson with Kahlee Sanders. Wrex is referring to the piles of Reaper rubble adorning the beach. Shepard and Kaidan share a lover’s kiss as the sun sets in the background over the horizon of the ocean. To withdraw the fleet click HERE. Click HERE to see the ending where Shepard dies. Author’s note: If you liked any of these stories I ask you to please leave a comment below and/or share them on other sites such as Facebook and forums, e-mail and blogs or any other way you can. Thanks! Contains samples from Vigil, who knew VI's could rock like that! ME3 Adept Femshep Ending With Garrus and Wrex. ME3 Engineer Ending with Tali and Wrex. (Tali Romance). ME3 Femshep Engineer Ending With Garrus and Wrex. ME3 Femshep Infiltrator Ending With Garrus and Wrex. ME3 Infiltrator Ending with Tali and Wrex. (Tali Romance). ME3 Femshep Sentinel Ending With Garrus and Wrex. ME3 Sentinel Ending with Tali and Wrex. (Tali Romance). ME3 Femshep Soldier Ending With Garrus and Wrex. ME3 Soldier Ending with Tali and Wrex. (Tali Romance). ME3 Ending with Tali and Wrex. (Tali Romance). ME3 Femshep Ending With Garrus and Wrex.